Planning and planting a backyard vegetable garden can be nearly as fun as harvesting and eating of the produce it delivers, but for first-time gardeners, choosing what vegetables to grow can be overwhelming. All vegetables are certainly worth growing, be they heirlooms or modern hybrids, but even a few common vegetables such as carrots and radishes often touted as 'easy' can be challenging for the new gardener. Here are a few of the easiest vegetables to start with which are proven as good performers with minimal effort. Lettuce and baby green (mesclun) is a fast and easy crop to raise if sown early. A crop of mesclun, be it comprised of bitter greens like arugula, mustard and cress, or simple of various leaf lettuce varieties, can reach maturity in as little as 40 days. Either buy pre-mixed Baby lettuce mixes or mesclun seed, or create your own custom mix with your favorite mesclun greens like spinach, arugula and mustard. Sow seed in a prepared, raised bed, either in wide blocks around 2 feet square (or in long bands, which can be 2-3 inches wide. Cover seed to a depth of 1/4 inch and tamp lightly and water well. Seedlings will emerge within 5-7 days, and will appreciate a light liquid organic fertilizer (10-10-10) every other week as with all fast-growing greens demand constant moisture and high nutrition to reduce stress and to ensure tender, lush growth. Harvest with scissors while greens are young, usually before they have their third set of leaves. Sow every two weeks to ensure a constant crop. Now that kale has evolved into one of the most popular of healthy vegetables, it undoubtedly it will earn a place on the home gardeners wish list. 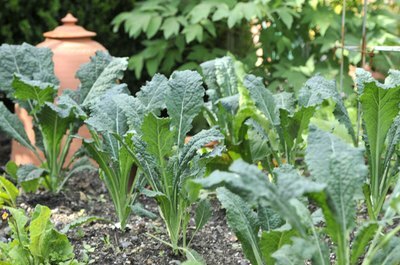 Ideally, kale is grown best as a cold weather crop, from seed sown directly in the garden in mid-July, and then grown on until the plants mature in late autumn. But you can cheat and grow a quick crop from seedlings set out in early spring, and harvested in their entirety in early summer. Kale seedlings are now a common item in garden centers in early spring, and these can be planted and grown on for a month or two, and then harvested as a quick, early summer crop. Young seedlings are preferred for spring planting, as these transplant with the least shock. Look for those with three pairs of leaves or less, any larger, and plants risk stalling once planted. Since you will be harvesting the entire plant in a few weeks, plant seedlings closer than those intended as a fall crop -- one foot apart will do, in rich soil which has been enriched with compost. Water well, and never allow the bed to go completely dry, especially during hot weather. You will want to harvest the entire plant around the end of June, while the leaves are still tender, and use in your favorite dish. With their large, easy to handle seeds and speedy growth, beans are ideal for the new gardener eager for success. The only choice you need to make here is whether to raise pole beans, or bush beans, both have their merits. 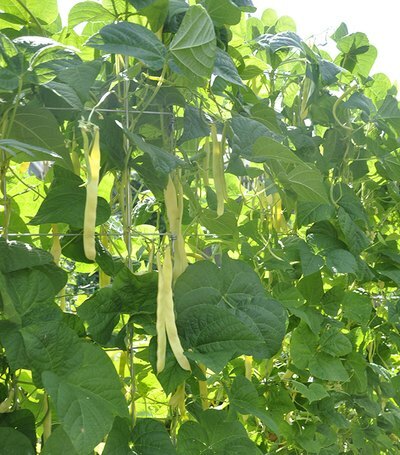 Pole beans will bear over a longer period but take longer to mature. They are also great space savers, but will require bamboo canes or teepees. Bush beans are earlier to harvest, but will run out of energy before pole beans mature, so you may need to sow successive plantings. Beans appreciate warm weather, all germinate best when the soil temperature is 60 degrees F or higher. You will want to wait until mid-June to sow your first crop. As with many home-raised crops, vigor will be assured if you apply a side dressing of an organic granular fertilizer. Beans are not particular, and a balanced fertilizer with an analysis of (10-10-10) scratched into the soil 6 inches away from the plants will be all that is needed. Watch carefully after plants bloom, for baby beans, they will mature quickly. Keep harvesting pods daily to ensure a longer season. Many are familiar with the most prolific of all summer vegetables, the notorious zucchini, but there are plenty of other summer bush squashes to try, each are easy and relatively carefree. Green or variegated scallop, heirloom yellow crookneck, green and yellow zucchini are just a few, and each are grown in a similar method. The large seeds can be sown directly into the soil once the soil temperatures are 60 degrees F, usually in mid-June in USDA Zone 5, or you can purchase pre-germinated seedlings in cell packs. 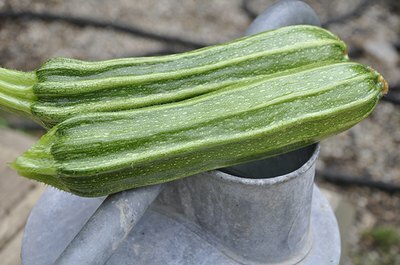 Risks are few, aside from powdery milder which can spot the leaves, caused by humid weather and air-borne spores, it is an inevitable plight which does not affect the fruit, but will eventually be the demise of any summer squash planting in late summer. It can be avoided by careful watering (early in the morning, so that the foliage can dry before nightfall), or by planting a second crop in late July, as younger plants are more vigorous. Tricks, tips and advice abound when it comes to the culture of these two crops, but their requirements are rather simple, yet precise. Regardless of the work, nothing beats the flavor of a home raised tomato. Start by avoiding the easy mistakes many gardeners make -- don't buy plants too early, and when you do plant seedlings, start with the youngest plants you can find. 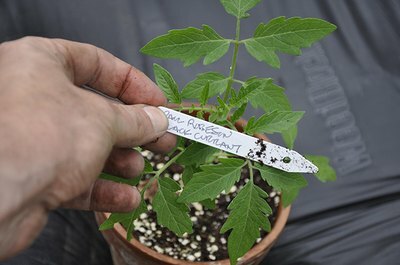 It can be irresistible to purchase large tomato plants, some even with blossoms or small fruit with the hopes of gaining a jump on the season, but the truth and science is solid -- those who plant the youngest seedlings will discover that they will have the finest and largest crops. Tomatoes and peppers, both solanum species, enjoy the hot and humid weather of mid to late summer, but they are both prone to a litany of soil-born viruses and diseases. Many aficionados now raise both tomatoes and peppers in containers using sterile soilless mix, such as a professional potting mix, which greatly reduces the early onset of many diseases, but even container grown plants will succumb eventually to airborne spores of late blight. You can only delay the spread of these diseases by choosing disease resistant varieties (such as Juliette F1) or by using a mulch to cover the soil with garden-raised plants. Tomatoes and peppers, in good years, can be highly productive. 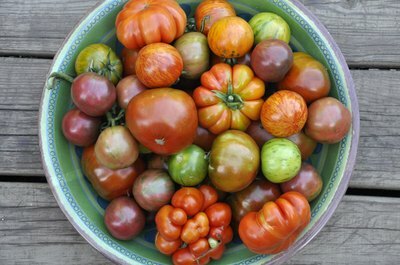 Chances of success can be increased by some simple tasks: Ensure that plants are well watered ( to reduce the chance of blossom-end rot) and use a good tomato fertilizer (look for one which is low in nitrogen -- not all are). In high summer, plants should be fed once a week. Create a schedule, and follow it to keep your plants as healthy as they can be, which will help deter fungus and viruses as long as possible.